Tikianna "Tiki," 12, left us on July 6, 2017 to be a forever angel. While searching for another fur baby to love and a companion for Gizmo, Roy found an article about a shih tzu named Tiki who could no longer be cared for by her family. It was love at first sight for all of us so our family decided to adopt her. Tiki immediately brought joy to us, our friends and to her doggie brother, Gizmo. Her personality was pure sweetness. 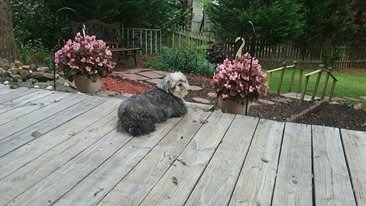 In her spare time (which was mostly all the time), Tiki liked to sit on the deck or in the backyard and watch the birds in the bird bath. She also enjoyed listening to her doggie friends Jake and Charlotte bark when they saw her in the yard. Christmas was Tiki's favorite holiday, with Thanksgiving a close second. Every Christmas, Santa brought Tiki a stocking with her favorite soft toys. Tiki's favorite food was chicken and rice but she enjoyed cleaning up any food that fell on the floor too. A "mommy's girl," Tiki would go to great measures to be next to her mommy at all times. Tiki also loved when her human sisters, Kathryn and Elizabeth, played with her and took her for walks. Tiki leaves behind her loving family, including Gizmo, and many, many friends. She will be missed by all of us. What a wonderful tribute for sweet Tiki. All the Mooney family members have such loving, kind hearts. We know Tiki was special and will be missed. You are in our thoughts and prayers. Let those sweet memories bring you peace.